The following is a guest post about Warren Buffett. If interested in submitting a guest post please read my guest post policy and then contact me. Warren Buffett needs no introduction. He’s one of the richest men on the planet, and known as one of the shrewdest and most successful investors of all time. There’s no doubt we can all learn a thing or 2 from someone this successful. Lets take a look at 6 different words of wisdom from Warren Buffett that anyone can incorporate into their personal finances and investing strategies to become more successful. Buffett has the mindset that lots of investors don’t – thinking long term. Too many investors buy a stock with the hope that it’ll double in price within 12 months so it can be sold, and the next big winner can be found. This simply isn’t the strategy for long term success in the stock market. Buffett is hyper focused on finding and investing in companies that he feels will yield long term results. He has no interest in the latest IPO, or the trendiest stock everyone is talking about online and on TV. Find stocks that you believe have long term growth potential. It’ll change your mindset, and your success rate. Buffett is solely focused on finding quality companies to invest in. His mindset when evaluating a company is to think as if you’re buying the whole company, not just the stock. You’ll find this mindset completely shifts how you feel about a stock. It makes the investment more personal, and this will lead you to evaluate the company on a much deeper level. Shifting your mindset from only being an obscure stockholder to the sole owner of the business is the mindset that’ll help you find truly great companies. Whenever there’s a recession you’re bound to hear lots of news about Buffett. In 2008 he invested $25 Billion into the market. He was getting in when the rest of us were screaming Armageddon, and getting out. One of his core beliefs is to buy companies at a discount, and recessions are the perfect time to find quality companies whose stock is discounted. He took advantage of this fact in 2008, and lets look at the results 6 years later as the market rebounds – he’s profited nearly $10 billion! Buffett got started young, and this was one of the factors that helped him have more success later in life. As a kid he sold chewing gum door-to-door, took a paper route, and even bought his first shares of stock at age 11; all while the rest of us were playing on the merry-go-round. Starting young allowed him lots of years to find success. He also was able to leverage the asset of time, and compounding interest to his benefit. Starting young is like rolling a snowball down a hill. The longer the hill, the more time the ball has to accumulate snow, and the larger it is when it reaches the bottom. Don’t wait to start investing or getting your personal finances in order. It’ll have a huge impact on your financial success later in life. Don’t procrastinate, start today! The great thing about investing is that there are thousands upon thousands of companies to invest in, and lots of different strategies that can all be successful. You should never try to use someone else’s investing strategy, or invest in a stock simply because someone else is. Develop a strategy and plan that fits your personal financial goals, and invest in companies whose business model and industry you’re already familiar with. You’ll never find success financially, professionally, or personally if you don’t challenge yourself and hold yourself to a higher level. One of the best ways to do this is to associate with people smarter, and more successful than yourself. As the saying goes, you’re the sum of the 5 people you hang around the most – so make sure those 5 people are all smarter than you! Author Bio: This article was written by Shelby Nousain, creator of the InvestingTips360 blog. He’s passionate about investing, and helping other new investors learn how to start their journey to investing success, which is exactly what the InvestingTips360 blog aims to accomplish. Nice article I must say Shelby. Obviously we can learn a lot from the oracle of ohama. Invest in the long term and what you know and also don’t procastinate. Those are the three vital lesson i can pick and i do hope to implement as i seek to be a top investor. Thanks Uche, I think we should all evaluate the principles of success from people like Warren Buffett & aim to incorporate as many of them into our own lives & investing careers as possible! Warren Buffett is very smart when it comes to investing. Unfortunately, he is advocating buying individual and small groups of stocks in this article. He is also advocating timing the market. He is obviously successful with these strategies. I have not been, and lot a lot of money in 2000-2003. Since then, I have gone with the Bogleheads, and buy low-cost passive index funds. and staying the course. Warren Buffett has recently advocated low-cost index funds for the average investor. When it comes to investing most of us really are average. I am happy with my total market average returns. I always love reading quotes from Warren Buffett. Everything he talks about is basic common sense, but when it comes to investing, so many people are irrational and expect to turn $100 into a million overnight. It doesn’t work that way. It takes time and you need patience. If you can master this, then you will be successful in the stock market. How about keeping modest? Everyone seems to remind us that the Oracle still owns the same modest Nebraska home he did before his billionaire status. From what I understand, many millionaires of the world still negotiate on prices and rarely pay retail. 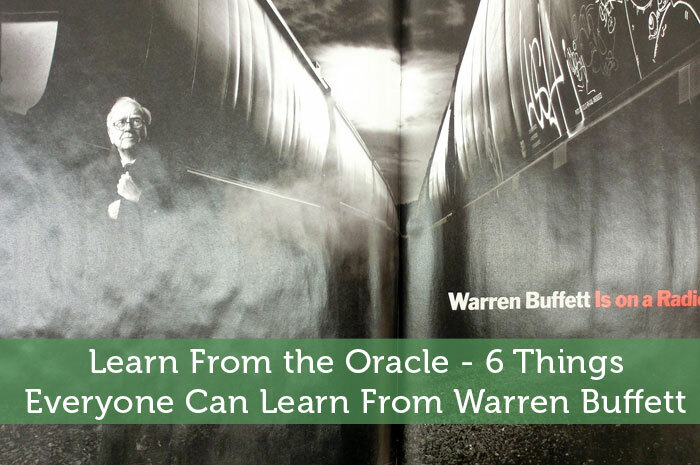 There’s always so much to learn from Warren. I love reading his quotes. Thanks for these invaluable reminders about investing. Fantastic article. Obviously a very wise man and young professionals like myself can do well to heed his advice!